Back in the 1970's as a little boy in elementary school around 4th or 5th grade Ronnie remember his mother knitting everything from mittens hats and clothing for him. Mom was a wonderful knitter but being from Germany she was not completely in tune with the American culture. Also, having 3 sons she always wanted a daughter. 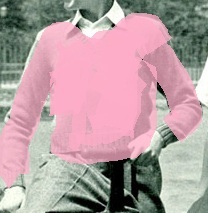 Ronnie's mom worked day and night and knitted the most beautiful pink sweater and another one just like it in purple. Ronnie feared that his mother would try to get him to wear it and one day it happened she had Ronnie try on the pink itchy sweater and his little brother the purple one. Both of them walked off to school miserable and waiting to get picked on. Ronnie was terrified as he entered the classroom. He sat in the classroom feeling as if everyone was staring at him. The teacher complimented him on what a pretty sweater he was wearing. During recess he discovered that his little brother was more crafty than him and wore a t-shirt under his purple sweater and before entering class he took of the sweater and carried it around. At the end of the school day Ronnie ran home and tore off the sweater. He told mom that he would never be wearing the sweater again and mom washed and folded and put the sweater away. To this day Ronnie still tells the tale of the pink sweater his mother made him wear to school. It was one memory that stayed with him a life time. This story as told from my hubby makes me laugh each time I hear it. Below I have included a free pattern of a boy's sweater to knit please be kind and make in your child's favorite color even if their favorite is pink or purple. Size 12 yr. — Scale: 6 ½ sts to 1 in. 1 Pr. Standard No. 2 Needles—14 in. 1 Pr. Standard No. 4 Needles—14 in. BACK: With No. 2 Needles cast on 96 sts. Work in ribbing of K 2, P 2, for 2 ½ in. Change to No. 4 Needles and work even in stockinette st until piece measures 10 ½ in. or desired length from lower edge. Bind off 5 sts at beginning of each of next 2 rows for underarm; decrease 1 st at each end every other row 3 times. Work even until piece measures 6 ½ in. from underarm. Bind off 8 sts at beginning of each of next 6 rows. Change to No. 2 Needles increasing to 34 sts. Work in ribbing of K 2, P 2, for 7 rows. Bind off. FRONT: Work same as back to underarm. Bind off 5 sts at beginning of each of next 2 rows for underarm, then work as follows: K over 43 sts, place on st-holder. On remaining 43 sts, decrease 1 st at underarm edge every other row 3 times; at the same time start decreasing 1 st at neck edge every other row 4 times, then every 4th row to 24 sts. Work even on remaining 24 sts until piece measures 6 ½ in. from underarm. Starting at shoulder edge, bind off 8 sts every other row 3 times. Work other side to correspond. FRONT NECKBAND: With No. 2 Needles, on right side of garment, pick up 62 sts from shoulder to point of V, 1 st at point of V, 62 sts from point of V to shoulder. Work in ribbing of K 2, P 2, decreasing 1 st at each side of st at point of V on every row, for 7 rows. Bind off decreasing as described above. Sew shoulder and underarm seams. SLEEVES: With No. 2 Needles cast on 48 sts. Work in ribbing of K 2, P 2, for 2 ½ in. Change to No. 4 Needles increasing to 54 sts. Work in stockinette st, increasing 1 st at each end on the 10th and every 8th row thereafter to 74 sts. Work even until piece measures 18 in. or desired length to underarm. Bind off 8 sts at beginning of each of next 2 rows for underarm; decrease 1 st at each end every other row 3 times, then every 3rd row 6 times. Bind off 3 sts at beginning of each of next 8 rows. Bind off remaining sts. Sew sleeve seams. Sew sleeves in place. My grandmother was a pack rat. So I got to see a lot of old catalogs and old how to sew stuff. When I was younger, I didn't think much of it. Had I known then what I had know now, I'd have kept it for vintage reasons myself.